Tour starts this weekend in Nottingham with Guns or Knives! September 3rd 2011 I Hate The Kids All-Dayer - The Victoria, Mile End. There have been some great all-dayers this year, and we have been lucky enough to be a part of some of them. We played the Big Horse Party 2 in Leeds, the British Wildlife Records Festival 5.5 also in Leeds, the Nice Weather For Air Strikes Festival in Brighton, Sausagefest VII in Fleet, the Feliciano All-Dayer in Kingston, and today, the I Hate The Kids All-Dayer in Mile End. Our journey took four and a half hours meaning that we not only missed Death Pedals, we missed Primo Leviathan and November Fleet too. November Fleet later got us back and left before we played, not out of spite, they had a genuine excuse and we didn’t mind as Nic [November Fleet and Solomon Grundy] had lent Gareth some sticks because he had forgot to bring his. Elks, Throwing Up, Holy State and Gum Takes Tooth played before us and I was especially impressed with Elks. Dan of the Math Jazz band Nitkowski described them as a mix of ZZ Top, Joy Division and someone else whom I can’t remember, but I did agree with him. Just before Gum Takes Tooth played, about sixty girls from a roller disco group arrived, and the already busy venue was now heaving and had become very hot and humid. I had the honour of picking one of the women up off the floor after she came crashing through a door onto the pavement beside me. She didn’t say thank you, but I wasn’t going to say anything because she was built like a brick shithouse and had tattoos instead of hair. This was one of the hottest shows I can remember ever playing. I was so wet that my fingers kept slipping off of the intended fret and sweat was dripping into my eyes making it hard to see. In a weird way, I quite enjoy playing shows like that. One Unique Signal played last and were as incredible as they always are. I used to hate all-dayers but I’ve had such good experiences over the last couple of years that I now quite enjoy them. After some drunken chat with Will [Lupins] and Wayne [Death Pedals] about weight loss, and how Wayne once ran the hundred metres in twenty six seconds, we drove back to Kingston, getting a kebab on the way. I woke up in the morning fully clothed with the light on and everything still in my pockets. Recently I have been listening a lot to “The Who Sell Out” and as we had a bit of a journey ahead of us, I thought it’d be the perfect opportunity to play it to Phil and Gareth. Our tape converter only plays one side of the recording so everything panned to the left was missing. The Who pan all the drums to the left, making it un-listenable, so I stuck on the other record I’ve been listening to a lot recently - The Slider by T. Rex. I understand that it’s probably not the coolest of records but I like it. I suppose it’s one of those records people would describe as a guilty pleasure. Personally, I wouldn’t. Eating crisps at a funeral or masturbating in the changing rooms at the local swimming pool would be a guilty pleasure, not listening to something you like. Malcfest is an outdoor festival set over the weekend nearest to Malc’s birthday. He has been doing it for a few years in his garden in Catford, but this year, found a field attached to a pub miles from anything else. It’s pretty much a festival for his friends and a few friends of friends. When we arrived we set about having a look around, She Makes War was playing on one of the stages and in the field next to it people were doing some Morris dancing. We’re not really keen on Morris dancing so we didn’t join in. I did however have the urge to borrow one of the sticks and have a stick fight with Phil. We didn’t, but if we had, we’d have both enjoyed that. The show was fun to play and the response from the crowd was great. I was starting to wish I’d been there the whole weekend because the atmosphere was perfect and the people were very friendly. Maybe next year. Another band played after us on a different stage, but because we were busy chatting to some people and packing our equipment back into the van, we missed them. We did catch Andy K and Thumpermonkey Lives! Andy K was brilliant and had the crowd in hysterics, I’ve not seen anything quite like it and if you ever see him on a bill, go check him out. Thumpermonkey Lives! were the headliners. They play a mix of metal and prog and are an incredible bunch of musicians. On the way back home our van lost power and we had to pull over onto the hard shoulder and wait for a mechanic. He arrived after about an hour but didn’t know what was wrong. 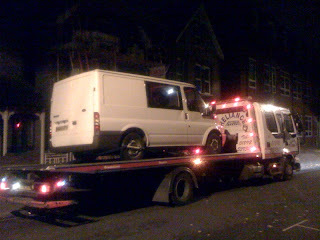 The mechanic put the van onto the back of the recovery vehicle and we all got a lift home to Kingston. Thanks to Alex, Wayne, Stu, Tom, Bass and Malc for inviting us to play these two great shows.